Be a Host Family this July! Would your family like to host a teenager from Spain this July? Since we hosted Maria last summer we are very excited to see Maria and her family this summer. They will be coming to Minnesota in July. We are looking forward to meeting Maria’s family and of course to see her again as well. You have a wonderful program and I’m happy to encourage other families to experience the joy of hosting a student. I want to let you know that Colleen and I are traveling to Toledo this summer to stay with Angela's family. I will be there for a week and Colleen will stay for a month. This trip is only possible because we were a host family for Angela. Thank you so much for making this connection for us. We love Angela like one of our own children. Your work has been such a blessing to us!! The Excitement Begins at the Airport! Information and pictures about the teenagers who will visit this July will be posted here soon. Please check back or call us for information. ​In the meantime, take a look at our Host Family Guide Book and Application by clicking on the links below. If you have a son or daughter of a similar age and with at least one interest in common with the visiting teenagers, please consider hosting! If you have questions or you know that your family would like to host this July, please contact Theresa Gunderson. O'Neill Language Academy, Inc. provides the wonderful opportunity of hosting an exchange student from Spain who is similar in age to one of your children! By sharing your home for the month of July, you will be giving a Spanish teenager the opportunity of a lifetime; to live with an American family and experience the language and culture of our country. In return, your exchange student will share a bit of the Spanish language and their historically rich culture with your family and friends. It will be a time of education, adventure and fun for all! Exchange students are placed with American families that have children of a similar age. We do our best to match interests & hobbies between exchange students and host family children. We encourage communication after the family stay is over. This can lead to lifelong friendships and a family and home for you to visit in Europe! Each summer several American teens visit their Spanish sister or brother in Spain! Our staff is very attentive to each host family and visiting student. We meet with you in your home to give you tips about hosting, we go to the airport with you to greet your student for the first time, we host all of the students for a welcome breakfast in our home, we throw a party for all host families and their students during the month of July, we take all of the students on excursions and we check in with you and your student during the month to insure everything is going smoothly. Our main goal is to match each Spanish teenager with a Minnesota host family who has a child or children of a similar age and with at least one similar interest. The more your child has in common with the child you host, the better they will get along and the greater the chances you will develop a long-term friendship wit their family in Spain! Nowadays modern technology such as Skype, email, Facebook, Instagram, WhatsApp (a free international texting app.) , etc. it is so easy to stay in touch with your new friend who lives on the other side of the world! If you think that one of the students on the power power presentation (see link above) would be a good fit for your family, please call Theresa at O'Neill Language Academy (651.264.0404). There will share more details about OLA's host family program. She will also meet with you in your home and share some tips on hosting, answer any questions and also give you a copy of OLA's Host Family Guide Book. (see link below). Our staff is available to answer questions and provide support before and during and after your exchange student’s stay. 1. Can we speak with our host student in Spanish? The main purpose of the visiting students is to practice and improve their English skills. This will happen naturally by simply living with your family and participating in your everyday activities with you. 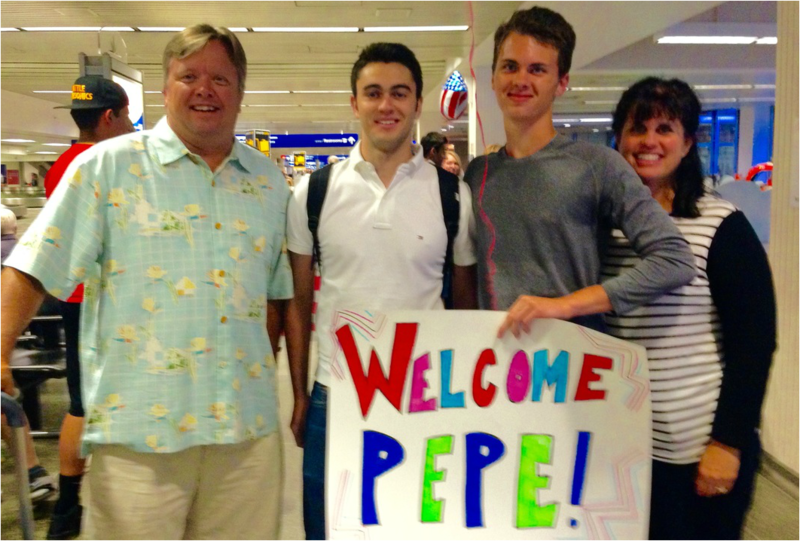 We ask host families to encourage their exchange student to speak English during their stay. 2. Does our family need to know any Spanish to host? Not at all. All of the kids from Spain have been studying English since kindergarten so they are able to speak at a beginning-high to intermediate-high level. If they do not know how to say a word in English they will use other words to describe it and you can help them with the right word. (This skill is called circumlocution.) Of course they will can look words up in a dictionary too. Their English vocabulary will grow tremendously during their month with you! 3. What are the Financial Responsibilities of the Host Family? We ask that you include your visiting student into your home as one more member of your family. The financial obligation differs with each host family depending on the activities you typically do. Some families eat at home most of the time and others eat out a couple times a week which would cost more. You may also do some extra activities such as go to a waterpark, go to a museum, go camping, etc. Host families pay for their visiting student just as they pay for their own children when doing these activities. Exchange students bring their own spending money to buy gifts to take back to their family in Spain and for things they wish to buy for themselves such as clothes or keepsakes, etc. Of course exchange students pay for their own airfare and medial and liability insurance. If you host a family, please know that your most important contribution is far from monetary. It comes from your heart-a willingness to welcome a child from Spain into your home as if they were a member of your family. Simply treat your exchange student with the same kindness that you would want a host family to treat your child. Host families do not receive compensation for hosting a student however they have an invaluable opportunity to learn about another culture and the opportunity to make a new friend from Spain. 4. Should our family go to the airport to greet our host student? Yes, this is one of the most exciting parts of hosting! OLA staff brings a welcome balloon for each student and host families bring a colorful welcome sign to give them the moment they get off the plane! OLA staff takes pictures of each host family and student and immediately sends the pictures to their families in Spain so they are rest assured that their children have arrived safely and are with their host family. Depending on the arrival of the flight, sometimes host families go out for ice-cream right from the airport before going home! 5. Am I responsible for providing meals? Yes, your student will eat every meal with your family-remember they are one more member of your family! 6. Where should our visiting student sleep? Visiting students can share a bedroom with a child of the same gender and similar age or have their own bedroom. They must have their own bed and be given a place to keep their belongings. 7. Will our visiting student communicate with their family in Spain while they are living with us? To date all of the visiting students have brought a mobile phone to Minnesota with them so they are able to send and receive emails from their families in Spain as well as talk with them on FaceTime, Skype, Instagram, etc. They will just need to connect with the wi-fi in your home. You will want to ask if they would like to use your computer to talk with their family on occasion too as the screen is larger. It would be a wonderful idea for your family to meet their family on Skype too! 8. What are the rules that the visiting students are expected to follow? Spanish students are expected to follow the rules and expectations of the host family. Before arriving to the United States they will attend a cultural awareness training and receive a handbook about American family life and general expectations of their host family. They will be instructed to make their bed everyday and keep their room clean and organized. They can also help with simple chores around the house such as setting or clearing the table, loading the dish washer, walking the dog or other duties that the host family expects their own children to do. By involving them in this way they will feel more a part of your family. 9. How will laundry work? Your visiting student should be invited to come and watch your child play their sport. However, on some occasions they may prefer to stay home as they will need and enjoy some down time too. Give them the option to stay home as they may want to Skype their family, communicate with their friends, gets some extra rest, etc. 11. Our family has a vacation planned in July. Can we bring our visiting student? Absolutely! Some of our host families have taken taken their visiting student on their family vacation to New York, Chicago, Canada, up north to a cabin, camping,to another city or state to visiting relatives, to a family wedding etc. What better way for them to learn more about the American culture, see more sites in the US and get to know your family better. 12. What are the exact dates of their arrival and departure? OLA will buy their plane tickets as soon as we have found a host family for all of the students. This usually occurs in mid April to early May. You can count on your students arriving between July 1-2 and departing around July 29-31. We make sure they have arrived in time to celebrate the 4th of July holiday with your family! 13. What kinds of activities should we do with our visiting student to make their stay memorable? Do not put too much pressure on your family that you have to entertain your student all of the time! First of all, involve them in your daily activities such as going to the grocery store (they love this and are amazed at the quantity of items available in our stores as well as the massive size of our stores). Have then watch or help you cook dinner, make cupcakes, chocolate chip cookies or an apple pie (our typical desserts). Have them go with you to take the dog for a walk, run errands, watch TV, play card, play video games or the Wii, play board games, everything you typically do as a family will be new, interesting and exciting for them! 14. When can our family begin to communicate with our host student and their family? As soon as your application and background checks have been processed. This usually occurs in early to mid May. We encourage your child (and your whole family if you would like) to get in touch with your student and their family via email, Skype, Facebook, Facetime, WhatsAPP, however you prefer. This is a wonderful opportunity to get to know them and their family before your student's arrival. This way your friendship is well underway even before you meet them in person! (See #5 below). 15. Our family would like to host a student this summer. What are the next steps? 1. Contact OLA and let them know which student you think your child(ren) and family has the most in common with. We will let you know if that student already has a host family or if they are still available to host. 2. Fill out the Application (see link at the top of this page) and email it to OLA. Part of the application includes a background check on everyone who will be living in your home during the month of July who is 18 and older. We also ask for a few references. 5. OLA exchanges contact information with your family and the Spanish family so you can begin to communicate. This might be just one email before their arrival or your child may communicate with them often. There is a wonderful app called WhatsApp. You might want to download this onto your phones. All Spaniards have this app and it allows you to text with them internationally for FREE. 7. OLA staff and host families go to the airport to greet their visiting student. (Be sure to make a colorful sign for them-see examples in the slideshow below.) OLA will bring a festive balloon for each student. 8. Enjoy your month with your new family member and international friend. Everything will be new and exciting for them!